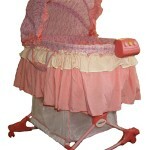 There are essentially two types of rocking bassinets to choose from – manual rocking bassinets or auto-rocking bassinets. A manual rocking bassinet gently lulls your newborn to sleep as you manually rock the bassinet, whereas auto-rocking bassinets provide a steady rocking motion at the flip of a switch or the turn of a dial. Some parents prefer an auto rocking bassinet that rocks their baby to sleep while they are free to move around the room or take care of other things. Other parents enjoy the act of manually rocking their baby’s bassinet and find this to be another form of bonding that allows them to soothe their baby and help them relax into slumber. Regardless of which type of rocking bassinet is right for you and your baby, rocking bassinets provide the comfort and convenience of a bassinet with the added benefit of the soothing, relaxing rocking motion that babies love. 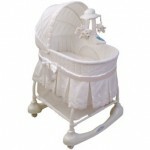 Purchasing a rocking bassinet is particularly helpful and convenient for mothers who have had a caesarian section or for parents with physical limitations that may inhibit rocking their baby. With a rocking bassinet, newborns can experience the soothing side to side rocking that comforts them even when rocking may not be an option for their caregiver. Of course, rocking bassinets are just as popular with parents who regularly rock their babies and who appreciate the benefits of gentle rocking for their baby’s overall comfort and contentment. A rocking bassinet provides convenience for parents and comfort for newborns with the compact design of a bassinet, combined with the calming effects of rocking. Parents can easily rock their baby to sleep, even when lying in bed, while newborns can enjoy a smooth, soothing rocking motion as they fall asleep. This entry was posted on Tuesday, April 14th, 2009 at 8:38 pm	and is filed under Bassinet Guides. You can follow any responses to this entry through the RSS 2.0 feed. You can leave a response, or trackback from your own site.